CityFox is scheduled for May 21 at 111 Gardner Ave. But they don't have a liquor license yet. EAST WILLIAMSBURG — A 6,000-person pop-up venue that took over a lot on Scott Street last summer is returning to a nearby location next week with the electronic dance music party group CityFox, according to organizers. "And so it begins..." the Brooklyn Mirage's Facebook event's post reads. 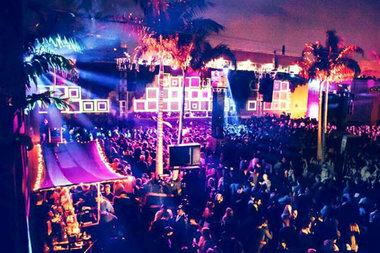 "The Brooklyn Mirage reappears for another summer of events at a new but nearby location, recreated but redesigned with countless improvements and surprises." The Brooklyn Mirage, which hosted more than 25 events last year at 99 Scott St., according to an email sent to community board members from the State Liquor Authority, has applied for a liquor license for their new location at 111 Gardner St., several blocks away from last year's location in vastly industrial East Williamsburg. Their first party will be run by CityFox, the Zurich-based party throwers who tried to host a rave in a Superfund site last Halloween, workers at the Gardner Street location confirmed. The May 21 lineup will include DJ's Adriatique, Atish and ThugF--ker on the massive lot's three different stages. Organizers began the process of applying for a liquor license with the community board on Wednesday, but were asked to come back to next month's meeting with more details because of the magnitude of the project, though that would be weeks after their first scheduled event. Party group representatives, who declined to give their names following the meeting, said they will attend a sub-committee meeting on May 24 with more details about the "multi-use venue [for] DJ events, art events and other multicultural and beverage events." But even that meeting is day's after their first scheduled event. "We are doing everything we need to do to meet all the requirements," said Benjamin Roshia, a representative of Avant Gardner LLC, the company listed on permits at the Gardner Street site. The company wouldn't say whether or not they have obtained a special event permit, that doesn't require community notification, and would allow them to serve alcohol for the day on May 21. Last year, for their Scott Street location, Brooklyn Mirage received a letter of support from Brooklyn Borough President Eric Adams without local input, DNAinfo previously reported. The State Liquor Authority granted the organizers 27 permits for their Scott Street location, a list to the community board shows, which directly contradicts regulations clearly posted on the SLA's website that only allow four special event permits for a single location per year. The State Liquor Authority didn't return an immediate request for comment. "That might raise an eyebrow, it's unusual," said Argilio Rodriguez, an attorney at Rodriguez Law PC who specializes in dealing with the State Liquor Authority. "That seems to be a group of people trying to get around things." Tickets are $70, and can be purchased here.